LONDON MAY DAY ORGANISING COMMITTEE MAY DAY 2013 TRADE UNION RIGHTS – HUMAN RIGHTS – INTERNATIONAL SOLIDARITY MAY DAY 2013 TRADE UNION RIGHTS – HUMAN RIGHTS – INTERNATIONAL SOLIDARITY Everything we have won to make a better life is under attack. Education is being hit.. Health services, pensions, welfare benefits, council services are all being cut. Fire stations are threatened with closure and engines cut. Ambulance services are being cut. Sports and youth services are being decimated. We need affordable houses and controlled rented accommodation. We need jobs for everyone. The rich are getting richer even though they and the banks created the current crisis across the globe. Big bonuses are back on the table. poverty and misery. We face massive costs for gas, electricity, water, public transport. We face cut or frozen income. We have to fight back together. We have to get rid of the anti-trade union laws that restrict our ability to defend ordinary people and get better conditions. We do all the work and take all the hits whilst those at the top get fatter. Join the fight back now. 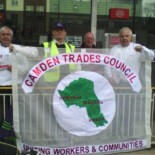 This entry was posted on April 12, 2013 by CAMDEN TRADES COUNCIL.